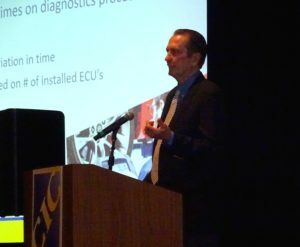 The sheer variety of diagnostic methods and vehicle options hindered Mitchell’s ability to set a definitive scanning book time, repair sales and service Vice President Jack Rozint told the Collision Industry Conference on Thursday. Rozint’s comments during his CIC Emerging Technologies Committee presentation help shed light on a question he said his information provider receives. Rozint said five different ways exist to scan a vehicle — something his CIC committee has highlighted in its extensive work summarizing such issues. They include running the diagnostic check in-house with an OEM scan tool or an aftermarket scan tool; connecting remotely to a scan provider (e.g. AirPro or asTech); subletting to a mobile technician; and subletting to a dealership, he said. All five have different labor times and couldn’t be normalized, Rozint said. OEM recommendations may include pre/post-repair scan(s) on vehicles involved in a collision to assist in discovery of any specific Diagnostic Trouble Codes (DTC’s). Refer to OEM specific position statement(s) and/or repair procedures for additional information. Database Enhancement Gateway Administrator Danny Gredinberg said last fall he had discussed the issue with CCC. He said he felt it was better to leave this value open, for there are “too many scenarios involved,” he said. The scan tool might not even communicate with the vehicle when attached due to the nature of the damage, or wires might be damaged by the collision, he said. Conversely, a lighter hit might not require as much scanning time. Different scan tools might behave differently as well, according to Gredinberg, giving the example of an OEM tool which have prerequisites before accessing a module, while an aftermarket tool might jump right to it. 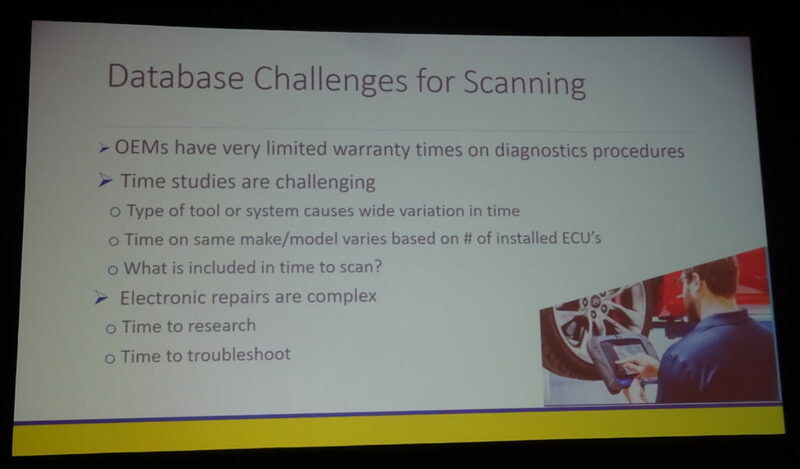 The Society of Collision Repair Specialists on Monday posted a video demonstrating some of the steps which a remote scan could entail. SCRS Executive Director Aaron Schulenburg told the CIC, which received a special screening of the film, that members had told the organization they were having issues explaining scanning, particularly in-house work. 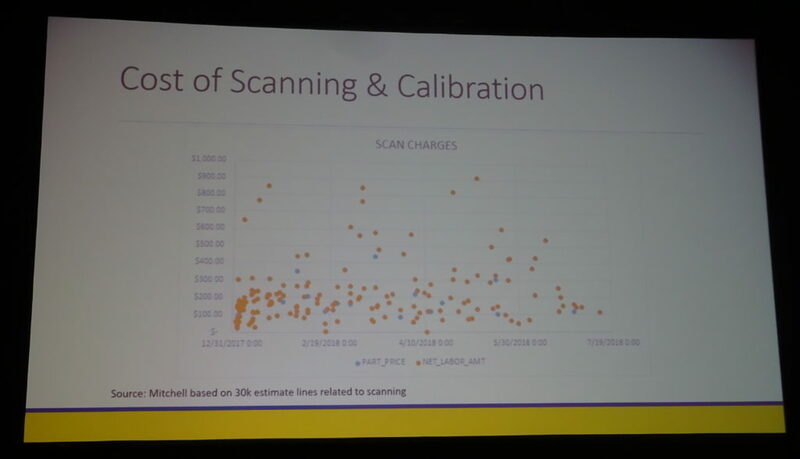 Even using the same scan tool might produce different labor times for two vehicles of the same year, make and model if the build data varies, according to Rozint. Scanning a base model might only mean the software checking 20 controllers, but a fully loaded variant of the vehicle might have 45-50 controllers to scan, which takes longer, he said. “All that’s being worked on,” including by Mitchell, Rozint said. But you couldn’t put a book time on research and troubleshooting, he said. No consistent, concrete price for scanning exists either, Mitchell records indicate. 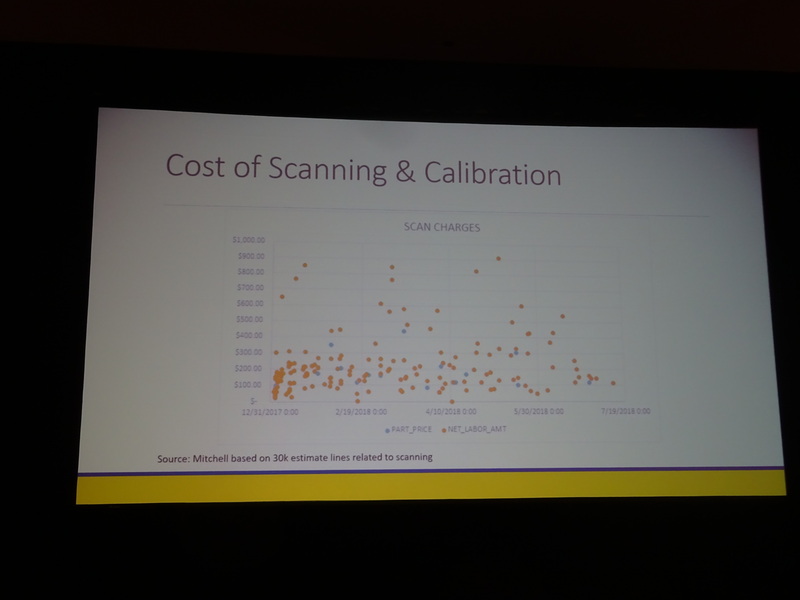 Rozint said his IP searched its database of historical estimates looking for common words related to scanning or major diagnostic provider brands. “It’s all over the map,” he described the results presented to CIC.